If you fancy a tiny home that is semi-mobile (can be moved around, but ideally not too much), I would go for a small wood or metal structure. I no longer recommend Tiny Green Cabins, Swanson or Tiny Healthy Homes because of the issues I have seen with their production and construction. There are no specific tiny home companies I can recommend at this time. However, if you would like to set up a consultation we can go over finding a good builder and how to supervise. I don't know of one for less than 60K. Budget at least 65K. Look into the experience of the builder, talk to past clients and look at what kind of warranty they offer. See my post on building a mould-free tiny home before proceeding. Joey, from HealClick, breaks it down to the essentials and delivers a safer trailer for $7000. 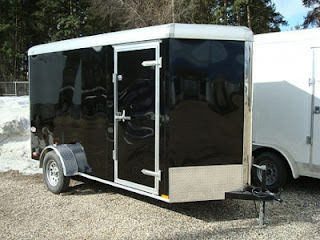 Here is my post all about cargo trailers. There is a lot more that has to offgas in these simple trailers than you might think. They take about a year to off-gas. 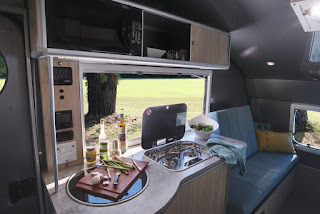 I had a Camplite by LivinLite travel trailer made to my specifications and you can find all the details about that here. They no longer customise it with metal walls which is a shame. Though the key thing I look for in a trailer is moisture proof walls and the laminated sandwich insulation (which I believe they are no longer using). You may still find a used one with sandwich laminated walls. The Safari Condo is another option to consider. "Roof and walls are made of a sandwich-type material with a plastic honeycomb core laminated with Alufiber on one side and aluminum on the other. Alufiber combines the light weight of aluminum with the durability of fiberglass. The only materials used in building the Alto are those on which water has little effect, such as aluminum, alufiber, plastic, Formica and glass. Inside, the furniture consists largely of aluminum and composite materials. Rigid and ultra-light sandwich panels are integrated into the bed cushions, while the entire bed structure is made of aluminum extrusions." They need a fair amount of time to off gas. 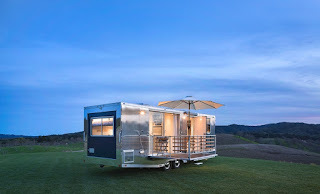 You could have a small metal trailer custom made in the style of the Camplite or like a tiny home. I have also seen cargo trailer custom made with metal SIPS though that is rare to find. The Weroll is similar to a cargo trailer but is more customized and you may be able to reduce the off-gassing with this option as well as streamline the process of converting it. Another type of non-toxic trailer is porcelain enamel on steel. This is an extremely tolerable material but it is not cheap. It's very rare to see a porcelain trailer for sale, many of them were made on poor quality RV shells which is a shame. But the interior of these trailers are very tolerable. Airstreams with metal walls can become tolerable fairly fast (for a trailer). I don't hear that they hold up to mould for a long time and I usually hear they are quite leak prone. If you do happen to find one in the sweet spot, offgassed but not yet mouldy, you may get a few years out of it. They do retain thier value well like fiberglass trailers. A new company making very tolerable trailers is Living Vehicle. They use closed cell rigid foam insulation sealed with tape and the interior is almost entirely aluminum including the cabinets. The countertops are Corian Quartz. The flooring is hard vinyl plank by Armstrong which can be tolerable for many people. The cushions are polyurethane which may or may not need to be removed. The price is 150K. This is a rare find because of the almost fully alumium interior, no structural wood (no hidden wood, and no wood in cabinets), 0 VOC countertops and flooring that should be tolerable to many people. Egg campers are made of a fiberglass shells that are very mould resistant and durable. Many sensitive people say that fiberglass takes a year to offgas the VOC styrene but some find it offgasses in a few days. Casitas use a carpet that is glued on to the walls and floor. At the time of writing, they would not customise one without that element. 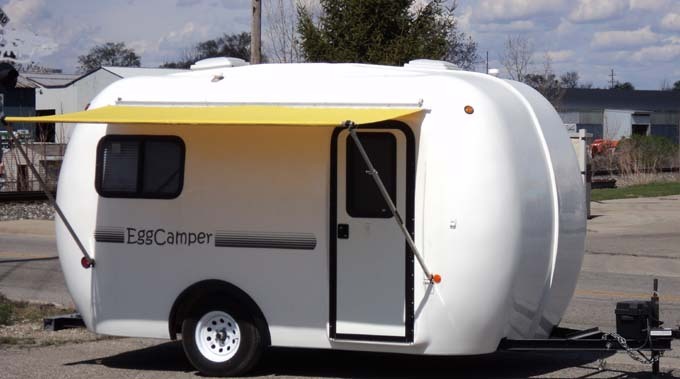 Look for fiberglass campers with moulded fiberglass furniture like Oliver trailers. Oliver uses vinyl flooring but they can make you one without the vinyl or cushions which makes it one the best fiberglass option I have found. They also have a good R-value and can be winterised. This is the only fiberglass trailer I know of that does not have wood products in the floor which would make it my top choice. Happier Camper is another company to check out as they don't use carpet or padding on the walls and the floors are fiberglass. The floors are composed of plastic honeycomb integrated with corrugated cardboard and resin. Trillium is willing to build without plywood in floors but it was difficult to convince them to leave the padding off the wall. Ideally, your fiberglass trailer has no padding or carpet on the walls, has fiberglass moulded furniture, no plywood in the subfloors and no vinyl or carpet flooring. I've looked at all the brands of fiberglass trailers currently in production in North America, so contact me if you would like to go into further detail in a consultation. A small teardrop can be made of all wood like this trailer (pictured) that I showcased in this post. The trailer came to 10K in materials, the labour would be about an extra 10K. It has basic wiring, no plumbing and a basic outdoor kitchen. The company Innovative Spaces can build out a cargo van. I don't have direct experience with them. 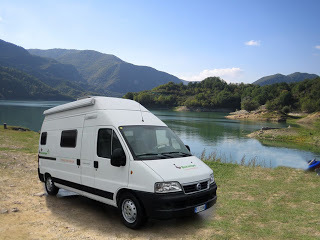 It is possible to buy a van of this type, strip it out and custom build the interior in the same fashion. Here is my post on the vans. Bigfoot - Made of fiberglass, EPS and luan, with vinyl flooring. Forest River RV Sunseeker Class C. A "Greener" RV company. Sunseeker has 1 piece fiberglass roof, aluminum frame, block foam insulation, no fabric except valances and bedspread, "low VOCs". I really like the roof on this model. Other Frest River brands are low VOC and slightly better construction than usual. Coachman is also low VOC, mold avoiders have liked the Freedom Express and Apex Ultra Lite. There are no affiliate links or sponsored content in this post. I'm not getting the floor insulation but the wall insulation is totally sealed off by the aluminum walls. If there are any spaces, aluminum tape can be used - aluminium fully blocks VOCs. I am wondering if yours doesn't have all alum wall panels or if it the treatment used to colour the walls, or something else that's bothering you. I would love to hear more feedback about it! Thanks! Hi Janice, are you selling your trailer? look into cork insulation. .. small planet workshop imports it from Europe. Also, cork is gas impermeable. Been thinking if I get a trailer I could use afm glue n just slap it on as many surfaces as seem offensive. Hey thanks for the tip! Do you know the link or the brand name of this insulation? Wow! Incredible and this is a nice blog with all good pics of the mobile home. I like to move one place to another place for visiting different places. I think it is perfect for me. Is this safe for me? This portable house reflects the talent of the house maker. Can you share the process through which you have made this so that I can make one for me. Thank you for sharing this beautiful and inspirational blog with us. Hi, yes upcoming posts will focus on the build of my tiny house/mobile home! I love that first trailer you have photographed! It is so darling. It would be so fun to have something like that, that would be easy to pack up and go whenever we wanted to. It's the perfect size for just my husband and I! Great article. Hope I had a good read. Waiting to read more blogs. What kind of tongues are used in the manufacture of "tongue" oil. My husband is really sensitive to chemicals and we are trying to find a good trailer. Thanks for the advice about aluminum travel trailers and how you can customize them to avoid most toxic elements. We'll have to see about getting an aluminum trailer to either sleep in or to help us haul or camping supplies. For the beach, we got a car hauler instead of a trailer so we could customize it: removed the walls, which were aluminum covered plywood for dimension strength, replaced with cherry tongue and groove (make sure he is ok with the wood first! Some woods are quite bothersome), replaced the floor with the same, and replaced the luan on the ceiling with stainless steel sheet. We chose not to insulate so we only use it nine months a year - it stays warm with a heater if it's 35f outside. Use a composting toilet. This is called modern living. A new pollution free era has begun for our teenagers. Have you (or has anyone in this thread) found a lightweight, chemical-free futon or sofa bed solution? I cannot tolerate chemicals (I became chemically sensitive after mold poisoning and have to live extremely minimally and can only have things made of materials that I can clean -- leather, metal, wood). They have to be lightweight because I have to move so frequently and start over again -- getting rid of old belongings that have become toxic to me. I'm looking for two things: (1.) a mattress topper that won't off-gas; and (2.) a lightweight/portable sofa bed that can be easily cleaned. I bought a full size mattress from IKEA that I'm not reacting to, but it's too firm and giving me major body pain. The mattress topper has to be returned because it's still off-gassing several months after purchase. I don't currently have a couch, but if I get one, I'd like it to double as a bed (so, a sofa bed I guess). It has to be super light-weight, small, mold-resistant, chemical-free and made of materials that can be cleaned with hydrogen peroxide or white vinegar. Any help or advice would be so appreciated. Hi, I know your post is over a year old but here's hoping you see this reply! I CANNOT tolerate new furniture, so I shop at furniture stores and ask them if i can buy something new, but take that same model that's been on the floor for a long time. Every store has worked with me on this, because they get a brand new item on their floor, and I get an already off-gassed piece of furniture. It may have a few cosmetic blemishes, but usually the transition into my home is flawless. Hope that helps! For a sofa, I am wondering if you might use an old style horse-hair sofa with wool upholstery. If the wood frame has stayed dry, it might be mold free. As for toppers, I bought one off Amazon; the egg-crate type. They sell them used on Amazon too, so maybe they will have off-gassed already. The one I bought had a strong odor that really bothered my breathing, but I aired it outdoors for a couple days and it became unscented and OK for me. I am thinking to build a tiny house on my property for a friend of mine who is super sensitive. It doesn't need to be mobile and I will build it in place. Can anyone steer me towards materials lists that are most likely to be safe? Can you tell me whether drywall and concrete cause problems for chemically sensitive people? Thank you. I am totally new to even thinking about this, so any good resources that come to mind, please feel free to send them to me. Hi this site serves as that guide. Each post is a category on different materials. I go over drywall and concrete. For more personalised advice I do consulting. I'm interested. Can you give me more details. Has this trailer been sold, or is it still available? I'm interested if you still have it - lcolee@yahoo. What do you recommend for a family of 7? None of these options seem big enough. Thank you! The biggest one on this list that I would buy is Living Vehicle. I have a Van that I would like to add a fiberglass high top to. Can anyone speak to offgassing concerns fron that? It totally depends on your level of MCS, from watching People's experience with fiberglass trailers some people move in almost right away and some people need years for it to off gas. It's not uncommon for it to need years. I've been privileged to own an Oliver travel trailer, grateful that there is no wood subfloor. However, a serious mold problem developed under the sink where there is a lot of wood (now removed :) Also I was told recently by Oliver that the wall dividing the bathroom from the rest of the interior has plywood in it - sandwiched between two layers of fiberglass. We are not the only owners whose bathroom door frame has allowed water intrusion and caused mold inside the wall.